There were a few Irishmen living in and around Trenton, NJ prior to the Revolutionary War. Among them were Paddy Colvin and Sam McConkey, who ran two Delaware River ferries; Paddy Lamb, who resided near Quaker Bridge on Assunpink Creek; and John Honeyman, a retired British soldier, now a butcher and cattle-dealer in nearby Griggstown. They were all there during a very special Christmas adventure. Toward the end of 1776, George Washington’s patriot army retreated from New York through New Jersey, headed for the Delaware River with the British army in hot pursuit. On December 1, he sent a message to Congress in Philadelphia to quickly line up a fleet of boats at Trenton to get him across the Delaware into Pennsylvania. Wexford-born Captain John Barry contacted his friend Cavan-born Paddy Colvin who set to the task. No bridges spanned the river and yet it had to be crossed quickly or the patriot army could be trapped on its banks. Colvin owned the closest ferry to Trenton and knew all the fords and obstacles of the river and how to avoid them. He also knew who owned boats and where they could be found. He placed all this valuable information, as well as his ferry, at the service of Washington’s patriot army. On December 3, Washington’s advance guard reached Trenton, and Colvin began ferrying them across the Delaware. Early on December 8, Washington crossed with the rear guard. Colvin was at his post continually and got the army safely across, just as the British entered Trenton. A disappointed Cornwallis found all boats safely moored on the Pennsylvania side of the river, which was now an impassable barrier between him and the disorganized patriot army he had hoped to capture on the Jersey shore. Cornwallis left a force to hold Trenton and re-located to Princeton. Washington set up headquarters in Pennsylvania about half a mile north of Colvin’s Ferry. Concerned that the British would build their own boats or bring them over land to attack him, Washington decided to cross the Delaware on December 25 and surprise them first, but he needed to know the disposition of the British in Trenton. He met with Armagh-born John Honeyman, a local butcher and cattle dealer who had retired from the British army, but was now supporting the patriot’s cause. As a butcher, Honeyman had traded with and was familiar to the British and their Hessian allies. From him, Washington learned of the meager force of Hessians left by Cornwallis to guard Trenton. Under the pretense of having escaped from Washington’s camp, he was sent back to the Hessian camp to inform their gullible commander, Col. Johann Rall, that the colonials were in no shape to attack. He told Col. Rall that Washington’s men were demoralized, suffering dreadfully from the cold and hunger and that many were unshod. 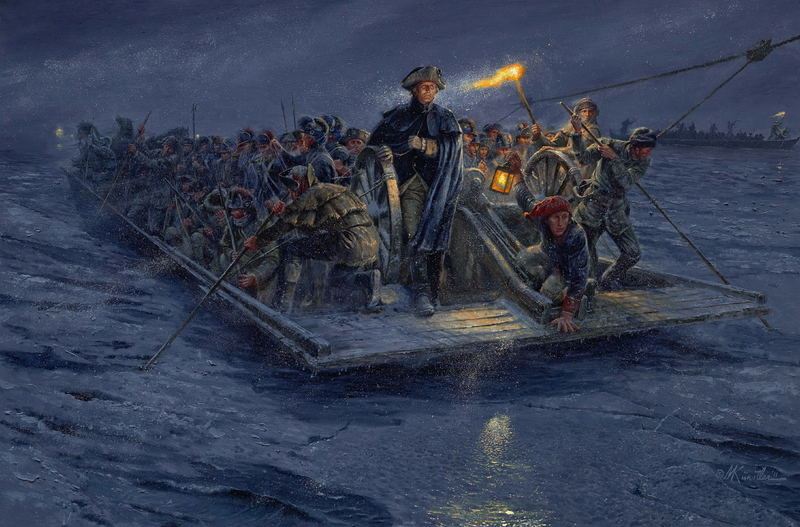 Hoping that the Hessians had been lulled into a false sense of security, Washington chose that bitingly cold Christmas night to cross the ice-choked Delaware River and surprise the unprepared Hessian force who would likely have spent the previous night celebrating Christmas. Like most of Washington’s clandestine operators, few formal records exist of Honeyman’s activities, but his actions were recognized and celebrated by friends and family after the revolution. Washington then arranged with Paddy Colvin to cross at a few ferries since Colvin knew the river better than anyone and was trusted as a friend of Capt. John Barry. Like Honeyman, Paddy Colvin’s name would have been forgotten were it not for Rev. A. Lambing who, in 1885, found a mention of him in an old Trenton paper. He resolved to know more about him, and made him a subject of investigation.1 Fortunately he did, for were it not for Lambing’s research, Colvin may have suffered undeserved anonymity in history. From Lambing we learned that Patrick Colvin of Co. Cavan, bought a ferry and land on the Delaware River in 1772 and for twenty years, Morrisville, PA was known as Colvin’s Ferry. Considering the number of times that Washington’s forces were transported across the Delaware, it was most fortunate that the ferry was in the hands of a patriot like Paddy Colvin. Colvin’s Ferry – the oldest ferry on the Delaware – was less than 2 miles from Trenton. The other nearest ferries were McConkey’s Ferry 9 miles above Trenton, Howell’s ferry 4 miles above and Dunk’s ferry 10 miles below. So it was that on Christmas night and the morning of St. Stephen’s Day, 1776, Washington quietly crossed the Delaware into New Jersey in a biting wind and snow storm and successfully surprised the Hessians and captured Trenton. Washington knew the importance of holding Trenton and that Cornwallis would soon be on his way back to recapture the town. He decided to stand and fight, but the rest of his army was still on the Pennsylvania side of the Delaware. Furthermore, he had about 1,000 prisoners to lock up. W.H. Davis in his History of Morrisville says: A long fatiguing march to McConkey’s Ferry would have been a great hardship to men so severely tried. There seems to be no escaping the conclusion that they crossed at Colvin’s Ferry. Thus, Washington re-crossed the river and mustered the rest of his forces to cross and fortify Trenton before Cornwallis could arrive. On Dec 30, Washington crossed back into New Jersey at McKonkey’s Ferry, with his troops crossing simultaneously at several Ferries.2 All the necessary boats were waiting, but the river was still choked with large masses of floating ice being carried rapidly by the swift current and extending out from both shores. Navigation was near impossible but Colvin supervised the crossing with great skill. Meanwhile, Cornwallis, hearing of the fall of Trenton, left two regiments to fortify Princeton and marched back to Trenton. Washington sent out small units, under Co. Offaly-born Col. Edward Hand, to harass the oncoming British. These small bands succeeded in slowing Cornwallis down, inflicting heavy casualties, but the British force still arrived in force by late afternoon on January 2. Washington was ready. The Second Battle of Trenton began with the armies facing each other, only 200 yards apart at a small bridge on either side of Assunpink Creek. Cornwallis made three attempts to take the bridge, but each one failed and Cornwallis withdrew for the night. Hundreds of British dead and wounded were recovered from the bridge and Cornwallis told his army, Rest now, we’ll bag the fox in the morning. That night, Washington’s army built up their campfires to burn all night and silently slipped away. A small group was left behind to noisily build fortifications as if they were planning to defend at dawn, but also to cover the sound of the rest of the army slipping away. Washington and his force led by General John Sullivan, son of Co. Kerry immigrants, snuck away in the night. Another local Irishman, Paddy Lamb, guided them along back roads around the British forces to launch a surprise attack on the British force left in Princeton. Cornwallis awoke in the morning to distant cannon fire as the attack on Princeton had begun. He quickly divided his army and sent a force to relieve Princeton but they were too late to prevent another American victory. Meanwhile, darkness put an end to the second battle of Trenton. The British were driven back everywhere. The little creek ran red with British blood as the entire campaign was decided in the patriot’s favor. As Washington went into winter quarters, he was master of New Jersey. The war had finally turned in his favor and new recruits poured in thanks to a courageous group of Irishmen who helped Washington’s army when they needed it most. McConkey, the owner of other ferry where Washington crossed some of his troops was also an Irishman by birth. Historian John D McCormack, editor of the Potter’s Journal whose painstaking research into the early history of New Jersey brought many obscure records of the Colonial period to light, was a native of Ballingarry, Co. Tipperary and no stranger to conflict. As a boy, he had been held by a British Police Squad that commandeered his family home during the Young Irelander uprising in 1848. McCormack wrote, Colvin was a Catholic and McConkey was a Presbyterian in religion. Yet I find that these two Irishmen, holding religious beliefs so divergent, laid their theological differences upon the altar of their country, and made common cause to secure our independence. It is a rule that has but few exceptions 3 and also a story that has few more laudable heroes. Washington’s army endured a bitterly painful Christmas so that we might enjoy a peaceful one. Let us remember their saving sacrifice this year as we celebrate the birth of our heavenly savior.